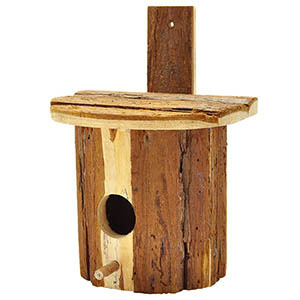 Placing an artificial nest box or birdhouse in your garden to attract a specific species to – in our case Bluebirds – means being aware of what the birds look for in a nesting site and replicating as close as possible the type of conditions and structure that they nest in out in the wild. 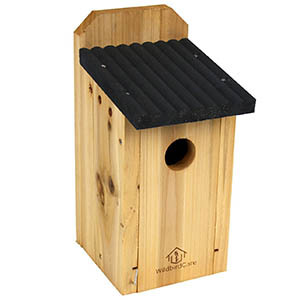 An enticing nesting box located in an area where Bluebirds are present is one that is almost certain to be used and appreciated as you create a safe haven for this widely loved and pleasant species. Once you’ve got that down, you can sit back and wait for the joyful day that your very first male Bluebird arrives to evaluate his new potential nest right in your backyard! Besides being a beautiful little bird, Bluebirds are superb garden companions as well thanks to their appetite for insects, including pests that may affect any food plants you’re growing. 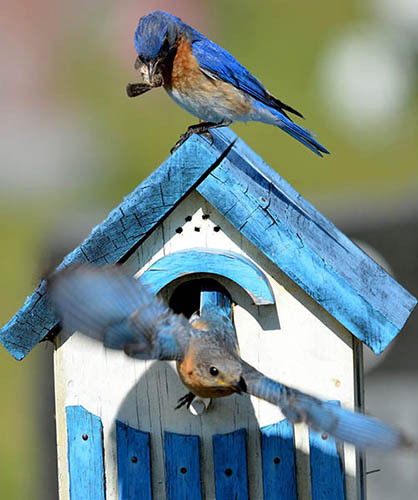 When planning to attract Bluebirds to your garden, be aware of the predators that will target them at birdhouses if you don’t take precautions including cats, raccoons and snakes. 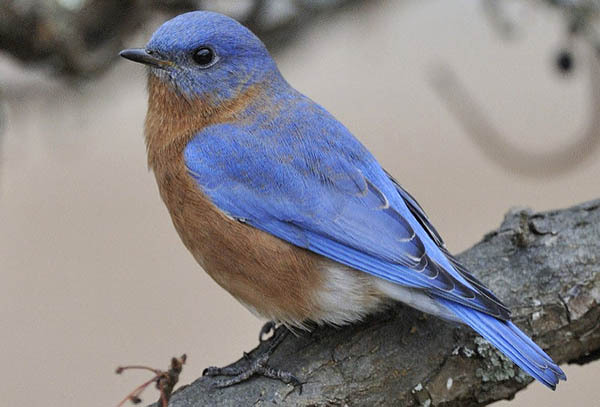 Where and how do Bluebirds naturally nest in the wild? In the wild, Bluebirds breed during the spring and summer time. They are able to have up to 4 broods in a season. Once a male has decided that he likes a nest site, he will then try and attract females to the site – a joy to see if this happens in your backyard through singing and displaying, and starting to line the nestbox with suitable materials. 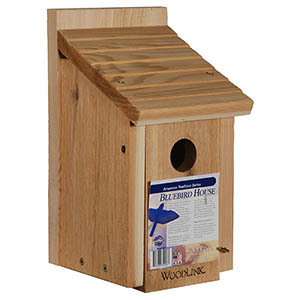 If you want to buy a ready-to-go Bluebird birdhouse then you’ll quickly notice that they are all designed similarly. This is of course to cater to the known basic requirements and preferences of Bluebirds, which is really important as you’re obviously not going to attract Bluebirds if you don’t provide what they need and like! 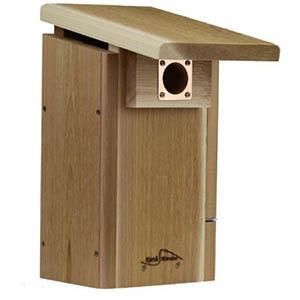 Cavity entrance hole size: if you get this wrong, you’ll have next to zero chance of having Bluebirds nesting in your box. The optimum size for the entrance hole is a round 1.5″ diameter. This is not only to ensure the Bluebird can fit in, but any larger and you leave an open invite to Starlings to use the box instead of Bluebirds – and they will always get there first. So don’t even consider a box that has a hole any larger than 1.5 inches. According to the Florida Bluebird Society, the most successful sizing of the floor of the nestbox according to their observations has been 5″ x 5″ square. Knowing as much as possible about the Bluebirds in your state and your local area can only help you to provide a wonderful environment for them in your yard or on your property. The more we know and understand the habits and behavior of a species, the more wonderous and interesting (and immersive!) it becomes to watch them in the wild doing their thing. The Eastern Bluebird is a beloved species in Florida. 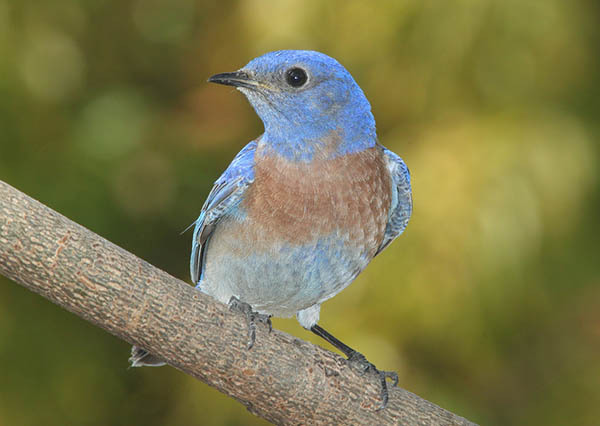 The Florida Bluebird Society exists to conserve and protect Bluebirds, as well as other native birds. In Florida, the Eastern Bluebird is found throughout the north and central areas of the state. They have many competitors when it comes to their nesting cavities, in the form of other birds like nuthatches and chickadees. Introduced species like starlings and house sparrows also compete with Bluebirds for prime nesting sites. 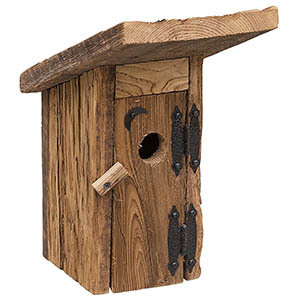 So it goes without saying that providing artificial nesting boxes for Bluebirds if you live in Florida is not only a joy for you, but a huge benefit to the species as well. 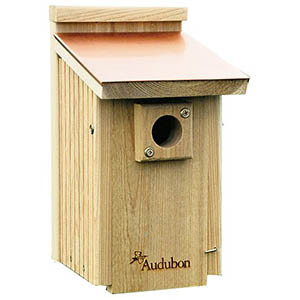 fact, thanks to human provided nestboxes, the population of the Eastern Bluebird in FL is thought to be faring better than in the past where it was on a serious decline because of loss of habitat. In places like Orlando you can be fortunate enough to see Bluebirds often if you have the right habitat for them. Feeding Bluebirds in Florida: because Bluebirds absolutely love mealworms, this makes it easy for people to provide for them in sensible quantities. Just as important, even more so for a healthy Bluebird population, is to let nature do the work by providing as many native plants as you can in your garden that will attract the insects that Bluebirds naturally eat, as well as the fruits and berries that are also imprortant for this species. If Bluebirds can find quality food in your garden, they’re more likely to intiially be attracted to your property. 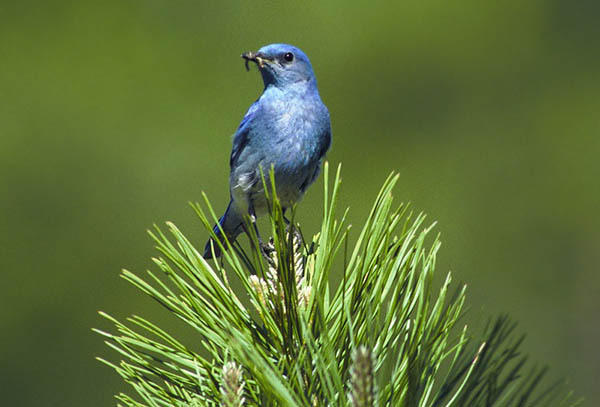 Insects and worms are a major food source during the summer for the Eastern Bluebird. A garden that does not use insectidies or other chemicals wlil naturally provide this food source for Bluebirds – and they’ll help keep any plant eating insects at bay for you as well. In winter, Bluebirds are found in larger groups and an important food source during this time is wild berries. In particularly cold locations, Bluebirds may spend time roosting in a nest box in small groups to keep warm.